I learned this from Peter Bellamy’s 1969 solo LP The Fox Jumps Over the Parson’s Gate. Bellamy learned the song from the great Harry Cox of Catfield in Norfolk (you can hear him singing it on the Topic double-CD The Bonny Labouring Boy) while Walter Pardon, from nearby Knapton, had a very similar version. Obviously this is a song which ought really to be sung by a woman, but with such an impressive list of male precedents, I won’t let this worry me. In any case, it’s a joy to sing. 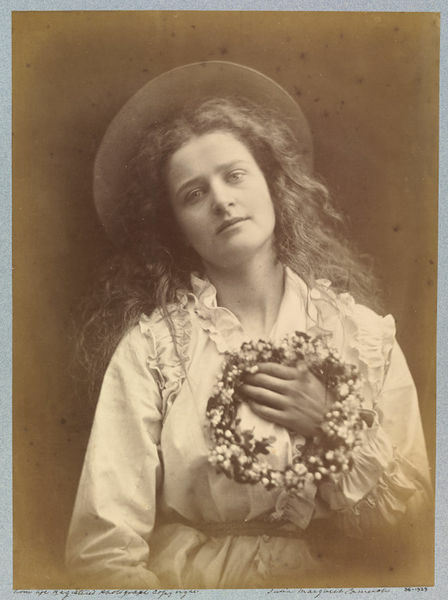 Julia Margaret Cameron, ‘For I’m to be Queen of the May, Mother’; The May Queen, 1875. Copyright Victoria & Albert Museum. This was the first song I learned from a book of folk songs, rather than from a recording of Steeleye Span or the Watersons. This meant that I had to take my own decisions about how to sing it, without having someone else’s arrangement in my head (having said that, I don’t suppose I sang it in anything like my own voice but, as with everything else in those days, as a curious amalgam of wannabe Tim Hart, Mike Waterson and Martin Carthy at his most idiosyncratic). I learned it, like last week’s song, from Fred Hamer’s book Garners Gay. Hamer recorded the song from Bedfordshire singer Harry Scott. Some recordings of Harry Scott have been made available, on the EFDSS cassette The Leaves of Life, but at present if you want to hear his ‘Queen of the May’ I think you’ll need to visit the British Library Sound Archive – which so far, I haven’t. Looking out of the window on this May Bank Holiday, I think the young lady in the song might well have said “I’m not going with you, because you’ll get my dress horribly muddy”; or perhaps just stayed at home in the dry.